When it comes to giving gifts for a wedding, sometimes it can feel rather dull to choose something from a couple’s registry. If you’re a sentimental gift-giver, it can be hard to get behind purchasing a new toaster or blender, even if the couple registered for those items. If you consider yourself the kind of person who loves to give meaningful and heartfelt gifts, you’ll want to check out these fantastic products that allow for something with a more personal touch and lasting impact. The key to this collection of gifts is that they are all personalized or customizable, creating a keepsake the happy couple is sure to treasure forever. Wine for a Wedding is a unique gift idea that allows the bride and groom to celebrate their special day for years to come! Wine for a wedding makes wooden boxes to be filled with wines to be shared on milestone wedding anniversaries. These custom engraved wooden three-panel boxes store the wine perfectly while also offering a lovely statement piece of décor to keep in the newlyweds' home. The boxes are made in America and can be ordered with or without a wine package, so the gift giver is free to choose his or her wines to include in the anniversary panels. Not only is Wine for a Wedding a gift that keeps on giving to the happy couple, but it also gives back to the earth by planting a tree for every box sold. Choose a gift box from Wine for a Wedding to give the bride and groom a personal gift they can admire and enjoy over their years of marriage. They also have a sister site called Box for a Bottle with box designs for other giftable occasions! Print My Watercolor is a boutique photography and high-end print shop. This innovative company will take a favorite photo and transform it into an archival quality watercolor work of art ready for hanging. You get to select the size, whether you want the print to have borders or brush strokes, and the wood color for the bars used for hanging. Print My Watercolor will take that special moment and create a one-of-a-kind work of art that the newlyweds are sure to love! You could choose one of their engagement photos or an image from their wedding day to have memorialized in watercolor art for their newlywed home. It is sure to be a unique and meaningful gift that the couple will treasure forever. 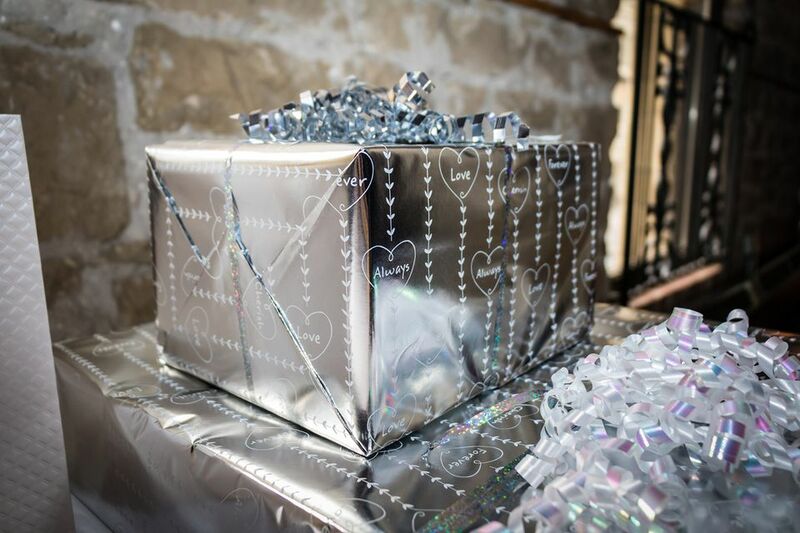 Flatterbox is the perfect sentimental wedding gift for a bride and groom to receive from the people who love them most. This simple concept and design is packed with major meaning and personalization, thanks to the collaborative effort of the recipients’ loved ones, colleagues, and friends. Wedding guests can share good wishes, memories or kind thoughts with the recipient(s) via an online collection system via email. Once all of the messages are received, a custom printed set of cards with all of the personalized notes is created and collected in a stunning clear acrylic keepsake box for a chic and heartfelt gift that is sure to be treasured for a lifetime. You can choose from a variety of card colors and customization options to create the perfect gift to express your love and happiness for the newlyweds.